Gut lesen, besser schreiben. 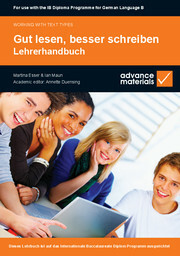 Lehrerhandbuch helps build up the skills of writing different types of texts at progressive levels of difficulty and in different styles and registers.Gut Lesen, Besser Schreiben Lehrerhandbuch provides answers and teacher guidance to accompany each of the 15 units in the full-colour student's book, Gut Lesen, Besser Schreiben - Schülerbuch. Gut lesen also gives a list of features that typify each text type. The units provide students with a model text and give them exercises that help them to analyse the structure and language of the text. They then work up to writing a similar type of text in a similar register of language. The approach trains students to reflect on the communicative purpose of each text and to use the language appropriate to the type of text and its audience; it teaches them to structure arguments in a clear, coherent and convincing way. The approach is lively and collaborative, encouraging students to work in pairs and small groups. At the end of the book there are essay templates, letter-writing templates, an annotated model essay and a grammar checklist. Full teachers’ notes and answers. Provides lively classroom activities that encourage student-to-student communication. Section 3. Descriptive/Informative: Wie verhindert man zu viel Stress? Ist Usedom eine Reise wert? Section 5. Discussing and persuading: Man ist, was man isst! Sollten Autos aus dem Stadtzentrum verbannt werden?